For protecting edges on panels, doors, glass, etc. It is also suitable for making a seal around glass in Aluminum window channels. The width of the section can be increased by bonding neoprene strip along side it, or the panel thickness can be reduced by bonding a strip into it. Panel Thickness:2.5-6 mm, Heigh:8-15 mm, Wall Thickness:1.5-4 mm. We specialized in manufacturing the rubber products for many years: oil-proof, acid-proof, alkali-proof, heat-proof, heat-proof sealing rings, sealing strips and different rubber articles. 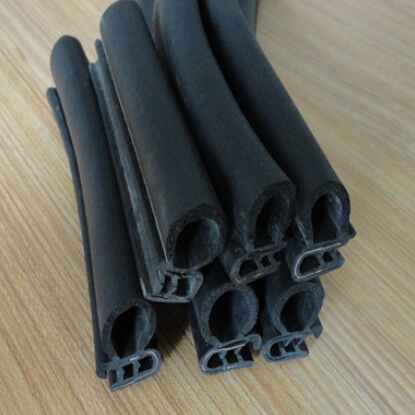 We also undertake to process articles according to the supplied samples of various rubber products. 1. Material: NBR, Silicone, BR, NR, EPDM, PVC, Neoprene,Viton, etc.